Start or Renew an Organization! The RSO application for the 2018 - 2019 academic year is now closed. The RSO application for the 2019 - 2020 academic year will open on May 1, 2019. Please note that there are two recognition seasons when the RSO Application is open, Fall and Spring. During the recognition seasons is when staff will be actively reviewing RSO Applications. Complete the RECOGNIZED STUDENT ORGANIZATION (RSO) APPLICATION. The RSO Application must have the names, RedIDs, and emails of at least five eligible student officers and one faculty/staff advisor. 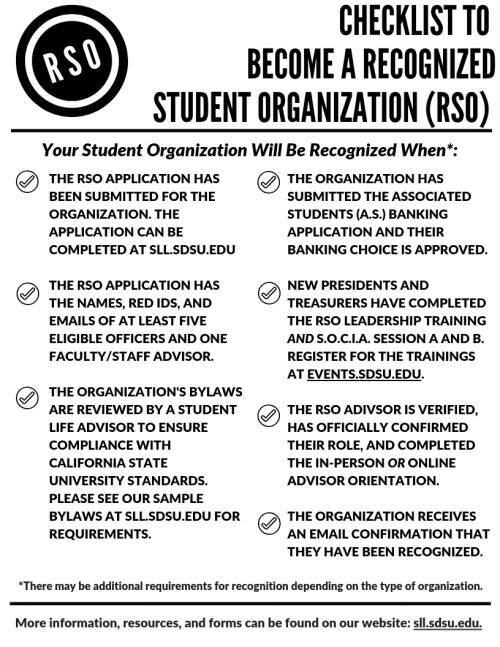 The organization's bylaws must be uploaded to the RSO Application with all California State University standards. Please see our Bylaw Template for reference. The organization must complete the A.S. Banking and Finance section of the RSO Application. If the organization chooses to use on-campus banking, they must submit the Student Organization Account Application & Agreement form. Learn more about student organization banking and finance here. The advisor listed on the RSO Application must confirm their role and complete the Advisor Orientation. The organization will receive an email confirming their recognition once all items have been completed. The RSO application can take two to four weeks to process. Use of SDSU's name, logo and symbols in conformity with campus policies. Meeting on campus, reserving space with Union Programs & Services and university facilities. Applying for and recieving office or desk space in Student Life & Leadership, subject to space availability. Scheduling and publicizing activities and events as approved by Student Life & Leadership. Participating in Student Life & Leadership and Unviersity events. Use of Presence for marketing, communication, tracking and assessment of the organization and organization related activities. Gratis publicity via The Daily Aztec and Associated Students communications when available. Posting of signs in reserved areas. Maintaing an organization mailbox in the office of Student Life & Leadership. Applying for and receiving funding of programs from various campus departments, subject to availability requirements. Belonging to and receiving funds from the A.S. College Councils, as appropriate. Receiving tax-exempt charitable donations through provision administerd by Associated Students. Certifying campus recognition for national or statewide affiliated organizations. For more information on the purpose of the recognition process and student organization policies and procedures, please review the 2018-2019 Student Organizaton Handbook. Contact Student Life & Leadership at (619) 594-5221 if you have any questions!